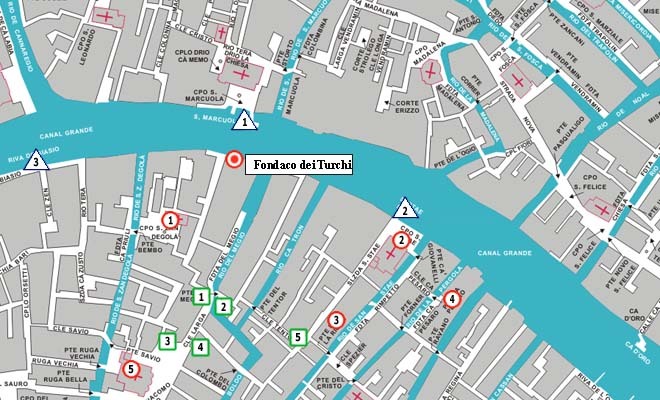 Venice Hotels Guide See Fondaco dei Turchi on the interactive Map of veniceXplorer. 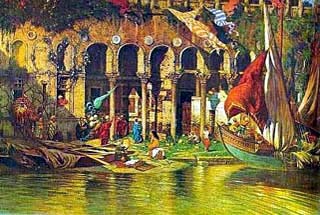 In 1381, Republic of Venice took the control of this building, and used the palace as the court of Duke of Ferrara, Nicholas II. From this it gets its name of Casa del Duca di Ferrara. Due to its architectural eligance, the palace was used to house princes and sovereigns, such as the Emperor of Constantinople Giovanni Paleologo (1438) and Alfonso D'Este (1562). In 1597 the last duke of Ferrara died and after four years of dispute over the ownership, the palace was sold to Antonio Priuli. 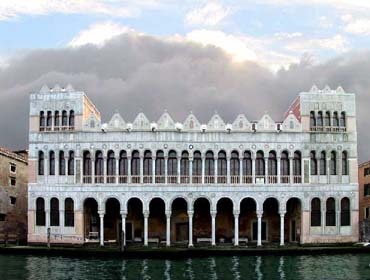 In 1621, Priuli leased the palace to Ottoman merchants to serve as the warehouse and from then on the palace was known as the Fondaco dei Turchi (the Warehouse of the Turks). By the early of 19th century, the trade with the East began to decline. On 1838, the palace was abandoned by the Ottomans and fell into ruin. By 1858 it was in such a ruinous condition that it had to be restored: the task was given to Camillo Boito who gave it its present appearance, maintaining the characteristics of the original buildings, i.e. its Venetian-Byzantine façade covered in marble. After the restoration work it became the house of Correr Civic Museum. 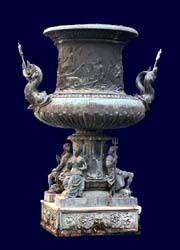 But in 1923 Correr Museum was transferred to its present home in St. Mark’s Square. Italian malacologist Giorgio Silvio Coen proposed to use the vacant Fondego dei Turchi for a Natural History Museum. This was to bring together the various scientific collections already existing within the city: at the Correr Museum, the Istituto Veneto di Scienza, Lettere ed Arti, the private collection of Count Alessandro Pericle Ninni and other smaller collections. Museum is currently on restoration. 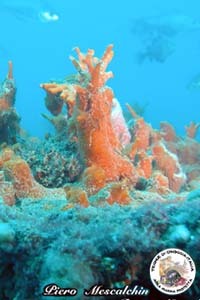 Only the Ligabue Expedition room and the Tegnue aquarium are open to the public. Set up on the ground floor, this five-metre aquarium holds more than 5,000 litres of water and re-creates the extraordinary eco-system of the tegnùe and their rich varieties of animal life: more than 50 different species of fish and invertebrates. A very accurate reproduction, this is a very effective teaching tool that makes it possible to admire these numerous species as if in their natural habitat. Biological discovery and the study of animal behaviour are guided by the rules of a simple game. This room contains a very atmospheric display of the finds made by the 1973 Ligabue expedition: not only the famous crocodile and dinosaur but also all the other fossils found at the time. The exhibits are accompanied by informative illustrations. The entrance is free to all.